A group of scientists led by Hanyang University Professor Kim Seon-jeong have developed yarn that can produce electricity through contraction and relaxation ― a world first ― according to the Ministry of Science and ICT (MIST), Thursday. Naming the invention the "twistron yarn," the research team expect it can be used for electronics products such as wearable devices, smartphones and drones that will be able to operate for longer without an additional power supply. "Unlike batteries, which can provide energy only for a limited time, the twistron yarn can produce renewable electric power unlimitedly and semi-permanently," Kim said. "We believe it has high potential for diverse industrial applications such as self-operating wireless sensors, mass power production in the ocean and lasting power supply for handsets and drones." Kim said the ultimate goal is to further improve the efficiency of twistron yarn's power generating capability and to make it mass-producible at a low cost. The researchers twisted a carbon nanotube to produce an artificial muscle in the form of a coil, which they call the twistron yarn. They put it in a pool of electrolytes and tugged on it to shrink the volume, which means its capacity to store electric charge instantly decreased. In this process, the twistron yarn produced electric power as its electric capacity continued to change, according to the research team. 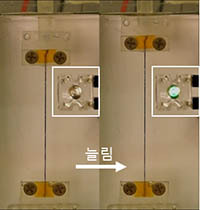 The researchers said they could turn on a small light-emitting diode bulb using only 19.2 milligrams of twistron yarn. Similarly, 1 kilogram of twistron yarn was capable of generating 250 watts of electric power as they repeat contraction and relaxation by 30 times a second, they said. Through another set of experiments, the researchers discovered that they can tap into the property of twistron to make it self-produce electric power in certain environments. They hanged balloons with the twistron yarn and put them into the waters at Gyeongpo Beach in Gangneung, Gangwon Province, to confirm that it could produce electricity with waves making the carbon nanotube contract and relax. When it is connected to a nylon artificial muscle that moves following the change of temperature in the air, the twistron yarn also produced electric power automatically, the researchers said. "Tapping into waves and the change of temperature in the air, we proved that the twistron yarn can harvest energy so that it can replace small, unused energy sources around us into a usable electric power," the researchers said. The research and development of twistron yarn will be released through international scientific journal Science on Friday. Besides Kim, his colleagues Kim Shi-hyeong at Hanyang University as well as Ray Baughman, Carter Haines and Na Li from University of Texas at Dallas have worked together for this paper titled, "Harvesting electrical energy from carbon nanotube yarn twist," the ministry said.